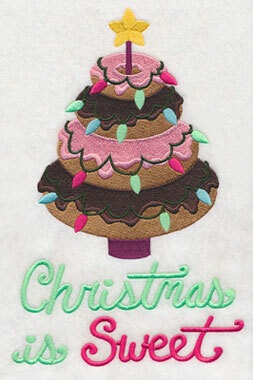 Welcome to Mrs. Claus' kitchen, full of sweet embroidery treats! 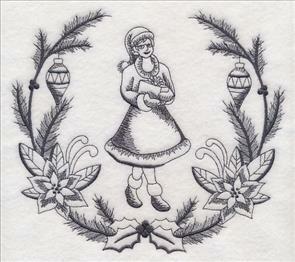 These festive designs are perfect for embroidering on tea towels, aprons, and other kitchen projects. 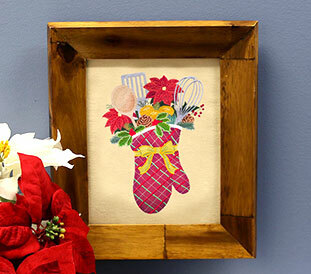 A striking oven mitt filled with festive foliage and cooking gear is perfect for framed art and pillows! 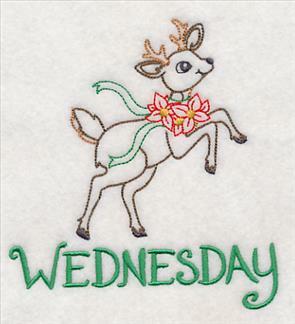 Add days of the week reindeer to a set of tea towels; sayings and samplers are stunning on aprons and placemats. 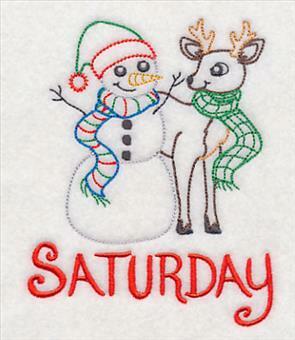 Plus, in-the-hoop cupcake toppers, coasters, and crafty cut applique, too! 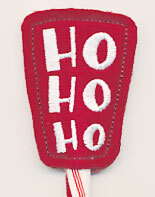 Order these very merry today! 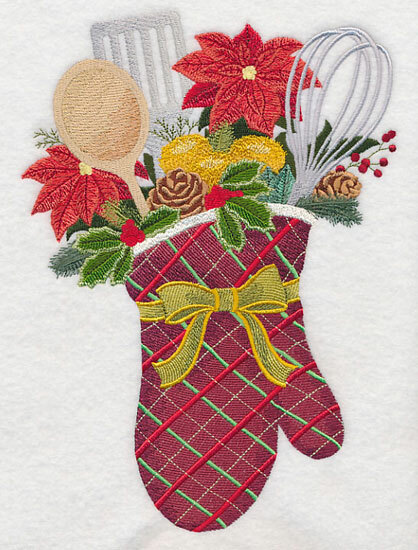 Gorgeous poinsettias, holly and berries, and more festive foliage fill this oven mitt with the beauty of the season. 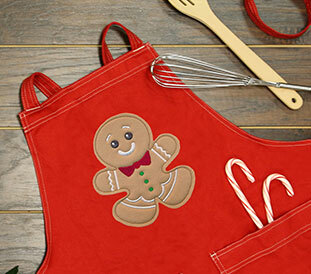 Classic cooking utensils, including a spoon, spatula, and whisk add extra-tasty appeal. 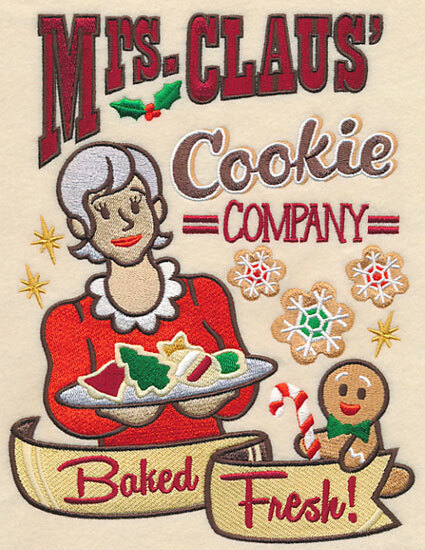 6.89" x 9.49" and 5.69" x 7.80" and 4.84" x 6.65"
Welcome to Mrs. Claus' Cookie Company! 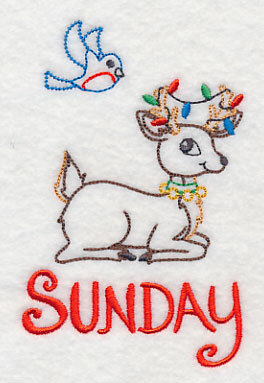 Stitch this show poster on wall hangings, framed artwork, and more for your kitchen (it also pairs nicely with the Santa Show Poster!). 6.91" x 8.99" and 5.86" x 7.62" and 4.86" x 6.32"
Blame your mischief on the elf! 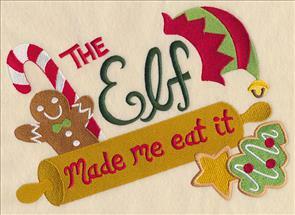 Disappearing Christmas cookies, candy canes, and more can all be explained by a simple "The Elf Made Me Eat It." 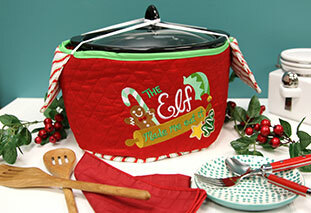 9.82" x 6.90" and 7.82" x 5.49"
6.90" x 4.85" and 3.87" x 2.71"
Add this too-cute design to kitchen projects, like this slow cooker cozy. 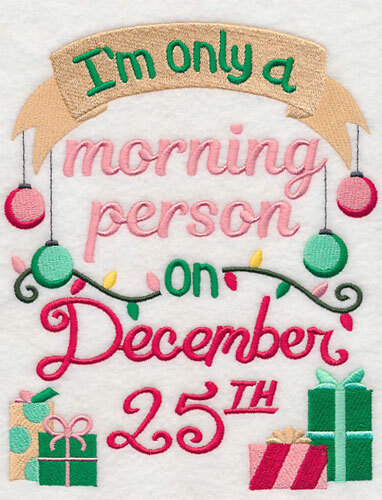 Show your love for Christmas morning with this punny design -- it's a fun addition to dish towels, aprons, and wall hangings for your home! 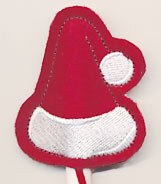 6.86" x 8.54" and 6.28" x 7.81" and 5.86" x 7.29" and 4.84" x 6.02"
Santa's team come out to play on December 24th! 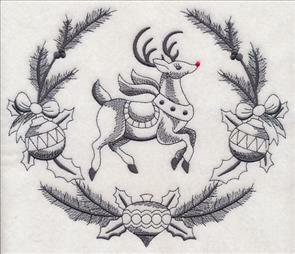 Two variations of this sophisticated square are available -- one with his team of eight, and another with his team of nine (including Rudolph). 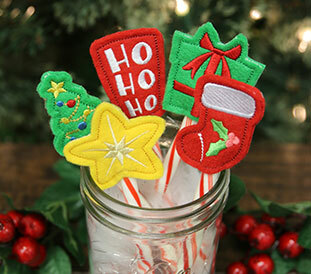 5.86" x 5.86" and 4.88" x 4.88"
7.81" x 7.79" and 6.92" x 6.90"
Stitch the sweetness of the season with these fun samplers! 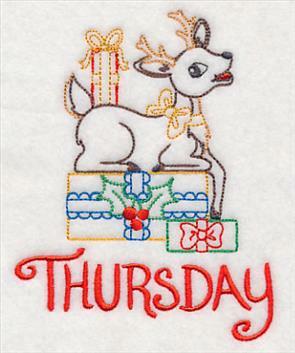 They're terrific embroidered updates for dish towels, treat bags, and more. 6.90" x 10.56" and 5.86" x 8.97"
5.10" x 7.81" and 4.49" x 6.87"
6.87" x 9.98" and 5.87" x 8.53"
5.38" x 7.81" and 4.72" x 6.86"
Sunday, Monday, Tuesday -- stitch an adorable reindeer for every day of the week with these vintage-style designs! 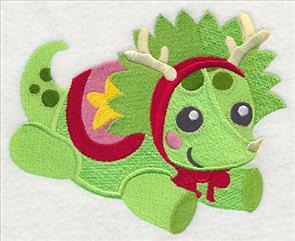 Bright colors and friendly smiles make them charming additions to any project. 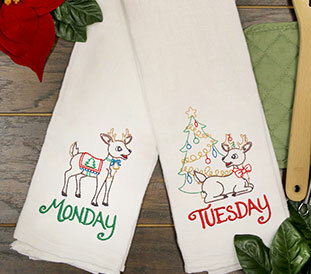 3.33" x 4.86" and 2.32" x 3.37"
Stitch all seven reindeer designs on a set of kitchen towels for the perfect hostess or holiday party gift! 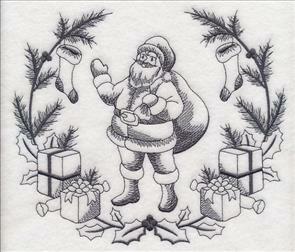 The vintage style is perfect for embroidering on tea towels and floursack towels. 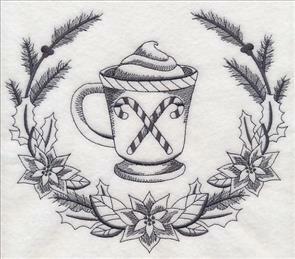 Get our best tips and tricks for stitching on tea towels here, and floursack towels here. 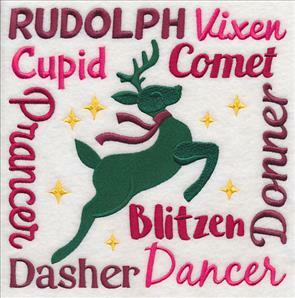 The text on each of these designs is featured on the last color stop, making it easy to remove and embroider the reindeer scenes on their own. 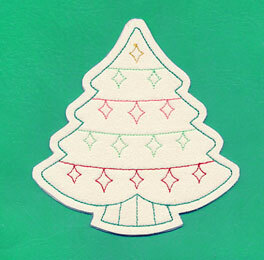 Try them on stockings, tree skirts, or table linens. 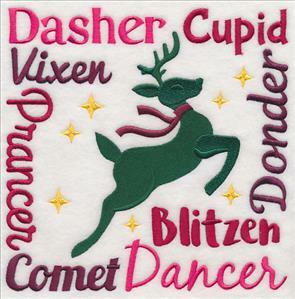 4.87" x 5.25" and 3.38" x 3.64"
Each of the reindeer are featured with classic Christmas elements, like winter birds, holiday gifts, or festive foliage. 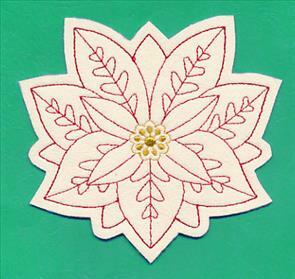 Perfect for stitching for the season in your home! 3.02" x 5.30" and 2.10" x 3.68"
For best results, stitch the light and airy designs on low-nap fabrics, including denim, canvas, tea towels, and twill. 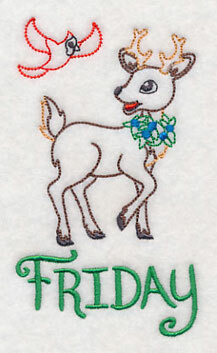 4.04" x 5.01" and 2.81" x 3.48"
Embroider a set of tea towels using these festive reindeer! Purchase them individually using the links above, or get them all in a design pack. 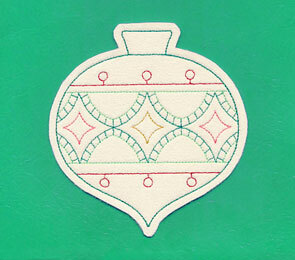 Update kitchen decor for the holidays in a flash with one-color laurels! 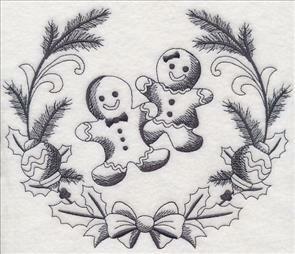 Here, Mrs. Claus and Santa stun in their quick-stitching designs. 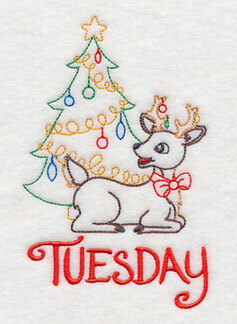 7.81" x 6.89" and 6.87" x 6.06"
8.03" x 6.89" and 7.06" x 6.06"
6.42" x 5.51" and 5.66" x 4.86"
A Christmas tree and reindeer are framed by pine boughs and ornaments. 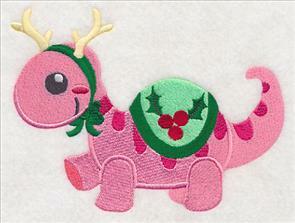 Stitch the reindeer with a red nose for Rudolph, or change his nose to black for all of the other reindeer! 8.21" x 6.89" and 7.22" x 6.06"
8.18" x 6.88" and 7.19" x 6.05"
6.54" x 5.51" and 5.77" x 4.86"
Add a delicious look to your next project with these kitchen-theme laurels. 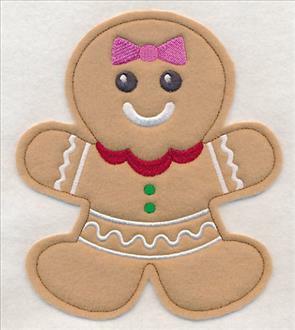 A pair of gingerbread are sweet on tea towels, or add a cup of hot cocoa to an apron. 8.42" x 6.90" and 7.40" x 6.09"
8.14" x 6.88" and 7.18" x 6.05"
6.51" x 5.50" and 5.74" x 4.85"
Bring an elegant look to your home with in-the-hoop Christmas coasters! 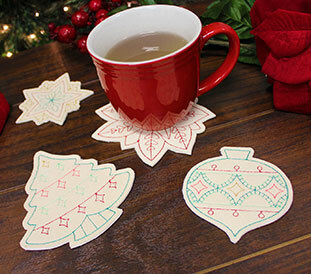 Not only will they protect your surfaces from cups of hot chocolate and eggnog, but the coasters come in classic holiday shapes, making them perfect for the season! 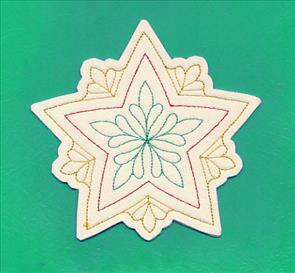 See how to stitch and assemble these coasters right here. 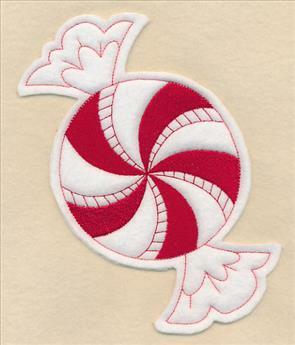 4.51" x 4.85" and 3.57" x 3.84"
4.85" x 4.52" and 3.84" x 3.58"
Cupcakes, candy canes, stocking stuffers, and more will get a festive look when topped with one of these in-the-hoop designs! 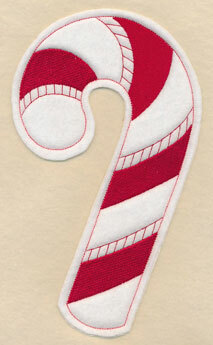 Seven versions are available now and will bring a fun look to your holidays. 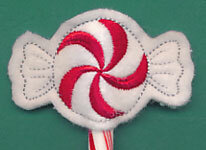 See how to make the in-the-hoop toppers here (and get fun ideas for how to use them, too!). 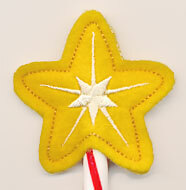 Update cupcakes, pencils, and more with these colorful in-the-hoop toppers. 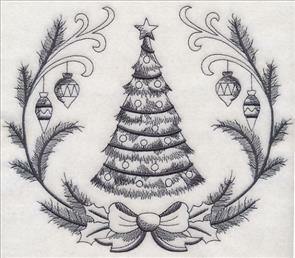 Purchase each topper individually using the links above, or get them all in a design pack. 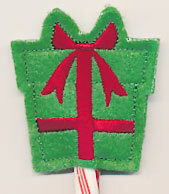 Designs smaller than 4" x 4"
What are the holidays without sweet treats to eat? 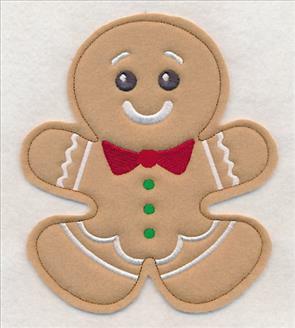 Stitch your favorite Christmas cookies and candies with these fun crafty cut applique designs! 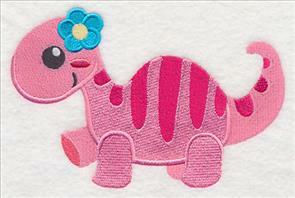 Fun embroidery adds the details to the designs, while your favorite fabric brings a personalized touch. Raw edges give the tasty designs a crafty look, too! 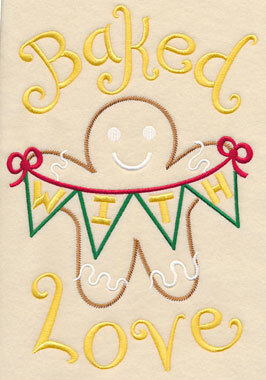 See how to embroider crafty cut applique in this tutorial (and video!). 5.74" x 6.61" and 4.74" x 5.46" and 3.27" x 3.78"
5.47" x 9.14" and 3.99" x 6.67" and 2.31" x 3.76"
Lily requested an adorable little girl dinosaur to embroider on towels, and we thought it was a fabulous idea! 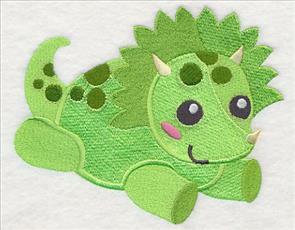 A coordinating boy dino has also been created to match. 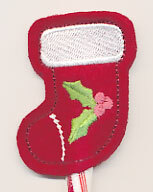 6.86" x 4.50" and 3.86" x 2.54"
Second versions perfect for the holidays have also been created. 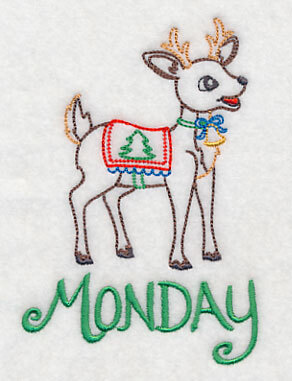 Adorable on kids' stockings, Christmas Eve pajamas, and more! 6.49" x 4.86" and 3.86" x 2.89"